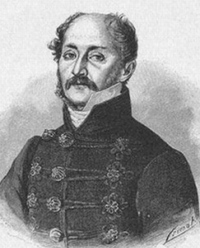 Sandor Kisfaludy (1772 — 1844), the descendant of an ancient and noble house, was born at Sümeg, and, after completing his education in 1792, became a soldier. A year later he joined the Imperial Guard in Vienna, and enjoyed the literary and artistic society of the capital, the while eagerly studying foreign literatures. In 1796 he fought in the French War, was taken prisoner at the siege of Milan, and sent captive to Provence, where the memory of Petrarch inspired him to write. On leaving the Arm in 1799, he married Roza Szegedi, the inspiration of the love-songs which laid the foundations of his fame. Petrarch was Kisfaludy’s model and master, and most of his poems are inspired by love, though later he found themes in the ancient glory of Hungary's nobility. Essentially a nobleman and a poet of the aristocratic type, his latest works met with scant appreciation, and he died, a lonely and disheartened old man, in 1844.